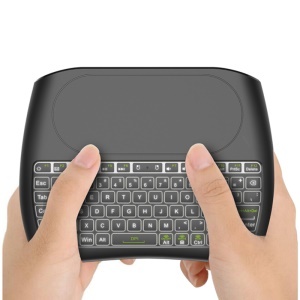 For just $ 11.43 , buy D8 Mini 2.4GHz Wireless Keyboard Air Mouse Touchpad Controller [7-Color Backlight / 78 Keys] from the wholesale webshop online. 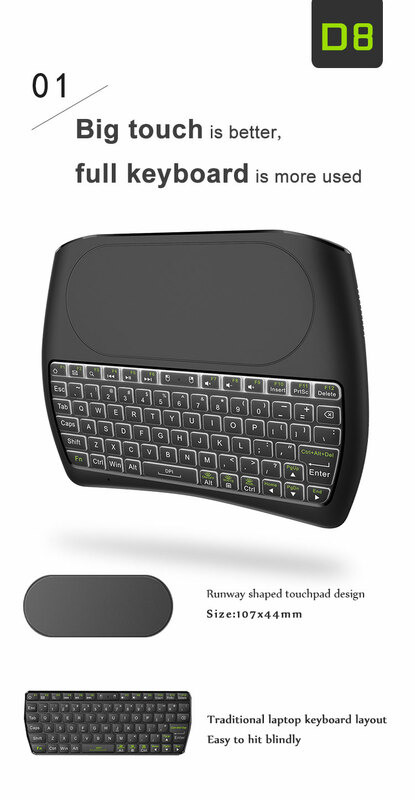 3 in 1 Multi-media Remote Control – The most mini wireless keyboard with multifunction: Touchpad + Mouse + Keyboard. 7 LED Backlights – You free to choose from 7 different LED backlights. You can not only use this keyboard at night with other lighting closed, not to disturb others, but also enjoy the good mood and wonderful experience it brings. Ideal for devices such PC, Pad, Mac, Projector, PS3, PS4, Google/Android TV Box, HTPC/ IPTV etc.